Here in Tallahassee summer is in full swing with high temperatures already hitting the 90s. In honor of the arrival of beach-going, sea shell-collecting days, the staff at Florida State University’s Special Collections & Archives invites you to explore the weird, wonderful and occasionally scandalous world of 19th century marine zoology. FSU’s rare books collection contains numerous illustrated zoological and botanical works including a large selection of illustrated conchological texts and a nearly complete collection of publications from the Linnean Society and The Ray Society. We picked three especially interesting and “beachy” books to feature in this special summer-themed post. So, break out your sunscreen and prepare to brush up on your knowledge of marine zoology! We begin with a foray into the sordid world of illustrated conchologies. For readers who may be unfamiliar with the term, conchology is the study of mollusk shells. The Conchologist’s First Book was originally published in 1839 and was the only work attributed to Edgar Allan Poe to be published in a second edition during his lifetime. 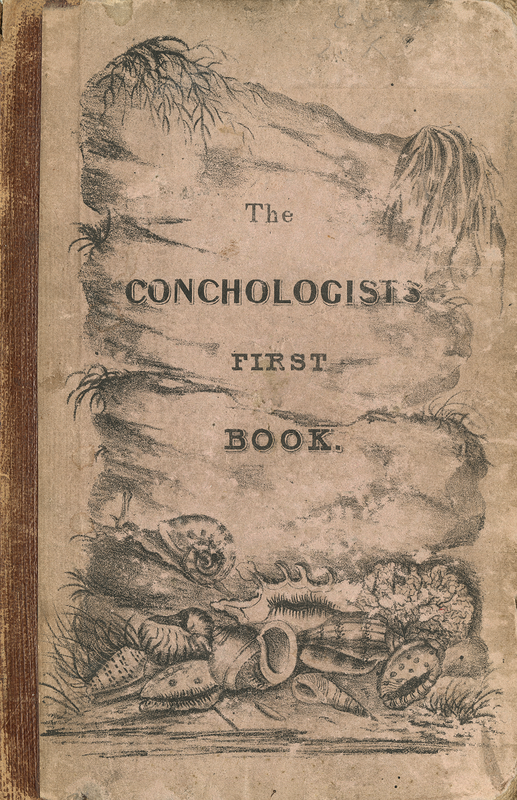 This first edition of The Conchologist’s First Book features the original uncolored illustrations which appeared in color in the second edition, published in 1840. The second featured book comes from the very same Captain Thomas Brown of the Poe-Wyatt conchological controversy. 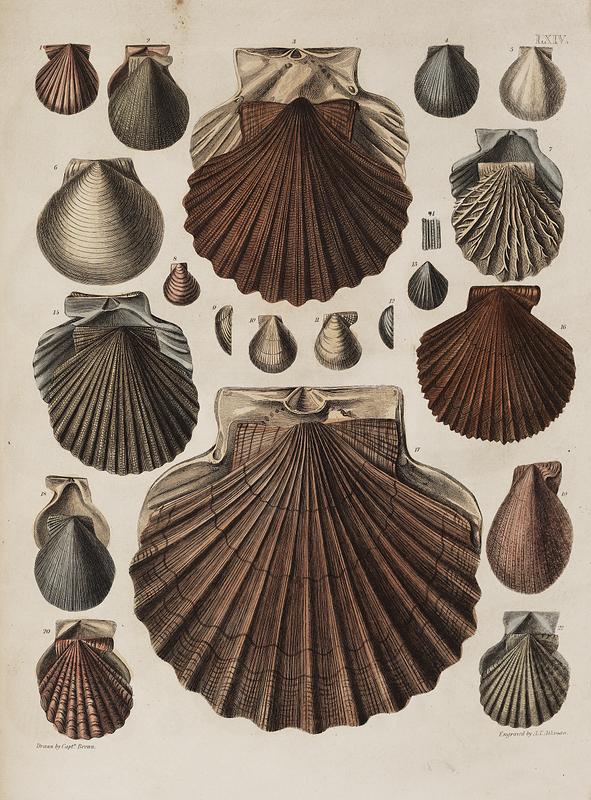 Illustrations of The Fossil Conchology of Great Britain and Ireland was published in 1849 and contains 98 superbly illustrated pages drawn by Brown himself. Among Brown’s claims to Victorian naturalist fame are his membership in the Linnean Society, his presidency of the Physical Society and the honor of having a species of sea snail named after him. With the final featured book we move away from mollusk shells and into deeper waters, so to speak. 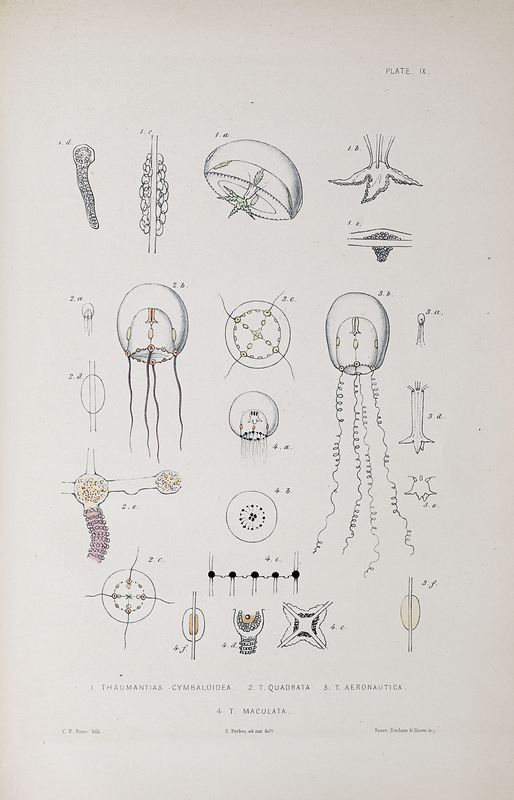 A Monograph of the British Naked-Eyed Medusae is number 12 of a series of texts published by the Ray Society. The Ray Society was established in 1844 with the expressed object of “the promotion of Natural History by the printing of original works in Zoology and Botany…”2 Unlike similar societies of the period, The Ray Society specifically sought to publish works of scientific merit that were unlikely to be commercially profitable and therefore unlikely to appear in print. A Monograph of the British Naked-Eye Medusae is one of many fascinating and beautifully illustrated volumes in the Ray Society’s long list of publications which also includes Charles Darwin’s A Monograph of the Sub-class Cirripedia: with Figures of all the Species and William Buckler’s Larvae of British Butterflies and Moths. These beautiful and interesting books are part of a large collection of illustrated Natural History books to be discovered in Florida State University’s special collections. 2. Curle, Richard. The Ray Society: A Bibliographical History. London: Printed for the Ray Society; sold by Quaritch, 1954. Florida State University’s Special Collections presents A Century of Seasons: The History of Florida State Athletics. 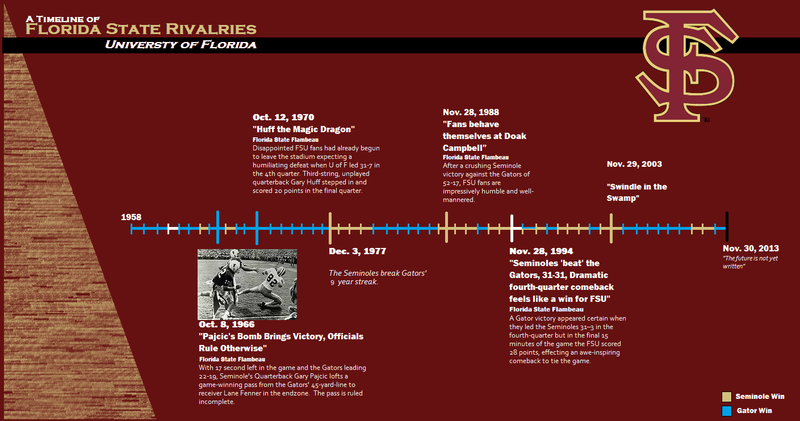 Visitors are invited to explore the history of Florida State athletics, which spans over ten decades, from the turn of the century to the modern day. Beginning in 1905 and ending in 1947 Tallahassee’s campus was a women’s college, then known as Florida State Women’s College (F.S.C.W.). These forty-years were marked by energetic school spirit, enthusiastic intramural rivalries and vibrant traditions. A Century of Seasons highlights this age of intramural competition between Odd and Even classes with images, documents and artifacts. 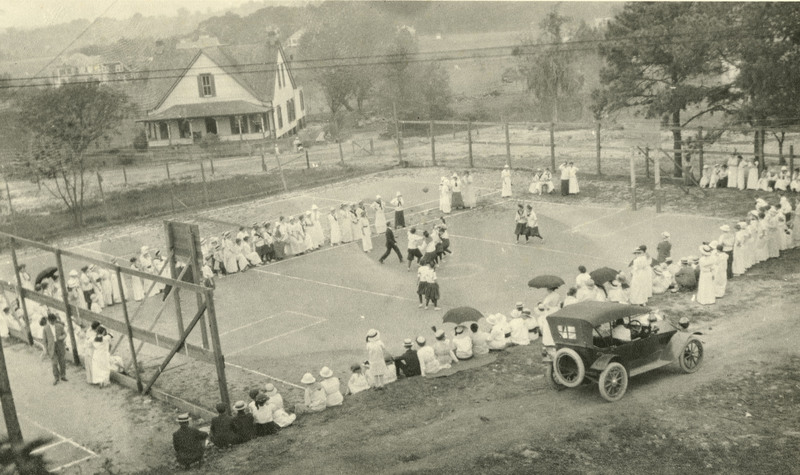 F.S.C.W.’s 1914 intramural basketball teams compete as fans watch from the sidelines. Basketball was phenomenally popular during the F.S.W.C years and, arguably, the most anticipated event of the year was the Thanksgiving Day competition. Photographs of the game and the athletes tell the story of this highly anticipated event and the women who competed in it. The exhibit also includes photographs and artifacts documenting minor and non-traditional sports played on campus over this period, including archery and an aquatic sport known as prelo. Wooden dumbbells from the early twentieth century have survived and are displayed next to an image of the tumbling class putting them to use. A collection of student scrapbooks, which contain unique photographs and ephemera from sporting events and provide a fascinating look at the way athletics, affected the daily lives of students. Each of the scrapbooks displayed portrays the personality of its owner and the collected photographs, newspaper clippings and ephemera with the scrapbooks shows a unique perspective on the athletes and fans who attended the university when it was yet young. A Century of Seasons: The History of Florida State Athletics is open from 10am-6pm in the Strozier Exhibit Room until February 2014. The arguably epic football rivalry between Florida State and near neighboring University of Florida has spanned over five decades. Although the first game between the two was played in November of 1958, the relationship between the schools can be traced to the first decade of the twentieth-century. In 1905 the Florida legislature passed the Buckman Act which disbanded Tallahassee’s coeducational Florida State College. The mandate designated the Tallahassee campus as an all-female school and changed the name to Tallahassee campus to Florida State College for Women while simultaneously establishing an all-male school in Gainesville. During the next forty years the University of Florida was viewed by many students at F.S.C.W. as their counterpart and many of the students in Tallahassee supported the men’s sports teams in Gainesville. 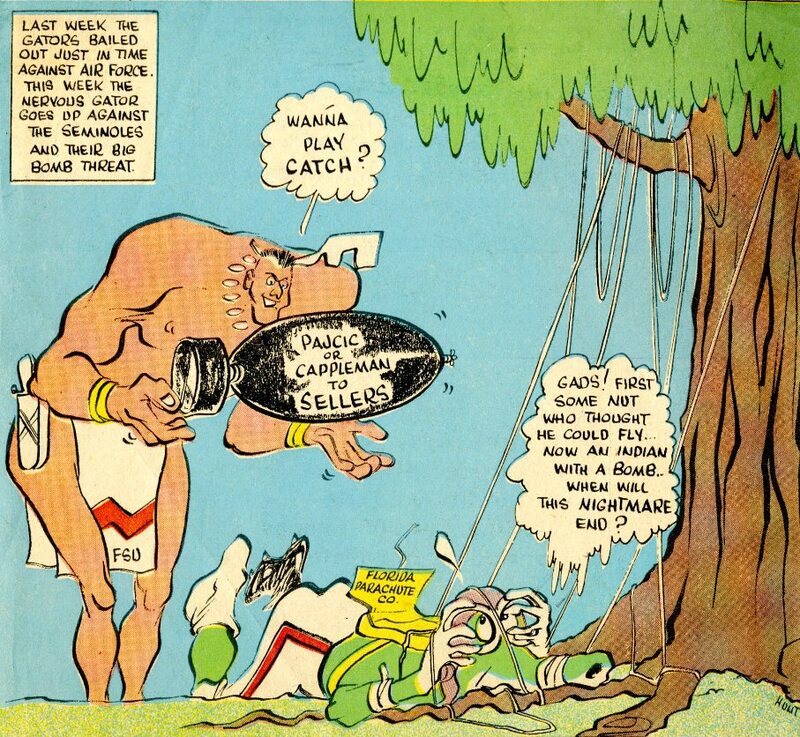 Following the Second World War the Tallahassee campus once again became coeducational in order to accommodate returning G.I.s who were seeking a college education and the newly christened Florida State University immediately established its own football team. It took nearly a decade of negotiation to finally sanction an annual game between the Florida State Seminoles and the University of Florida Gators. The first twenty years of competition were dominated by The Gators who achieved a nine-game long winning streak beginning in 1968 and ending in 1976. One of the most controversial showdowns took place in 1966, when a game-winning Seminole pass from the Gators’ 45-yard-line was ruled incomplete despite photographic evidence suggesting otherwise. The next day the Florida State Flambeau ran headlines announcing a Seminole win, despite the officials’ ruling. The rivalry became increasingly heated over the following years as Florida State began to even the balance with a four-year streak from 1977 through 1980 then again from 1987 through 1990. In November of 1994 the Seminoles made an awe-inspiring comeback to tie the Gators who had led 31-3 in the fourth-quarter. In 2012 the Seminoles put an end to a six-season Gator streak. The rivalry continues this month as the 4-7 Gators meet the 11-0 Seminoles in Gainesville on November 30th.